Hunters must adhere to all Texas Parks and Wildlife hunting regulations. Upon arrival you will need to pay the remainder of your balance, have your hunting permit, habitat stamp, and hunting license logged. We will also have a short orientation on hunting rules and regulations and you will need to sign a waiver. You will need your Hunters Safety card if born on or after September 2, 1971. Shot and injured deer are considered killed deer and we will help you look for your buck during the rest of your hunt. You may not get down from your location or walk around from the location where you are placed. You will be asked to leave if we find you wandering and walking Everything you take on the property you must take off of the property.....ex.. Scent bombs, wafers, etc. 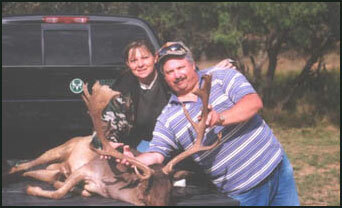 Hunters need to provide transportation to hotel in Eastland, Texas. Ranch personnel will transport hunters from hotel to ranch each day.